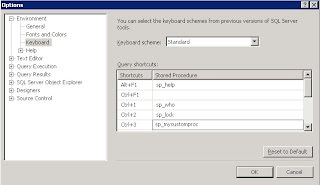 One of the things I like about SQL Server Management Studio (SSMS) is being able to customise some of the short cut keys - but it's one of those things that when someone sees it, and asks how you set it up, it's a pain to remember! So for those of you who have a new installation and have forgotten how to set up a short cut for your favourite proc, or those new to this keyboard shortcut feature, here is how you do it. With that selected, a new window titled "Options" will open. In here expand "Environment" and then "Keyboard" and you should see the right side of the window display "Query shortcuts". Now you can enter procs against the available Ctrl+x shortcuts - note that a few are fixed (like Alt+F1 as sp_help), but there are 7 or 8 that you can assign a proc against. 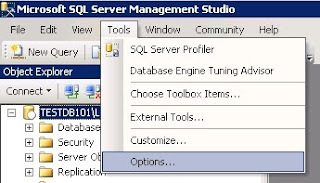 Note that these run in the context of the database you are connected to - so unless the proc you create or assign is an "sp_" prefixed proc that exists in the master database, it must be in the database you are connected to. Once this is done, click OK, and open a new query window (won't work for windows already open as far as I remember). Now depending on whether the proc you assigned needs parameters or not, you can simply press your shortcut key (e.g. Ctrl+3) to run it instantly, or highlight the relevant parameters (e.g. a table name) and hit the shortcut key.